« Michael, is that you? Niche books, such as the one we did to celebrate a venerable calculator club, have been possible for a while now with digital print-on-demand publishing. Now, Magcloud does the same for glossy magazines. If this makes you want to publish your own magazine, please do get the typography right; it makes such a difference if what’s on paper isn’t completely hideous. This Periodic table of typefaces is a good place to explore the commonest options (although, if he were real, I suspect Jack Bauer would be annoyed that it doesn’t include Bank Gothic). Speaking of when calculators were on the cutting edge of computing, none of the hardware modifications I did to mine were quite as illegal as turning one into a pipe for smoking weed. I guess I was never stoned enough to think that would help my programming. I can see what they’re trying to do with the Periodic Table of Typefaces, but it doesn’t really work for me. With the Periodic Table of Elements, there are similarities of characteristics for adjacent elements – especially those that are vertically adjacent. Other than the higher numbered fonts getting in some sense “heavier” towards the end of the table, I don’t see how the fonts relate to each other. Perhaps I’m missing something. I’m certainly no font expert. I do agree that the “Periodic Table” idea is often massively misunderstood by non-chemists, who just think it’s a distinctively-shaped-yet-inscrutible table for stuff, not realizing that its shape is determined by the properties of atoms, and the properties of other things would necessarily make their Periodic Tables different. 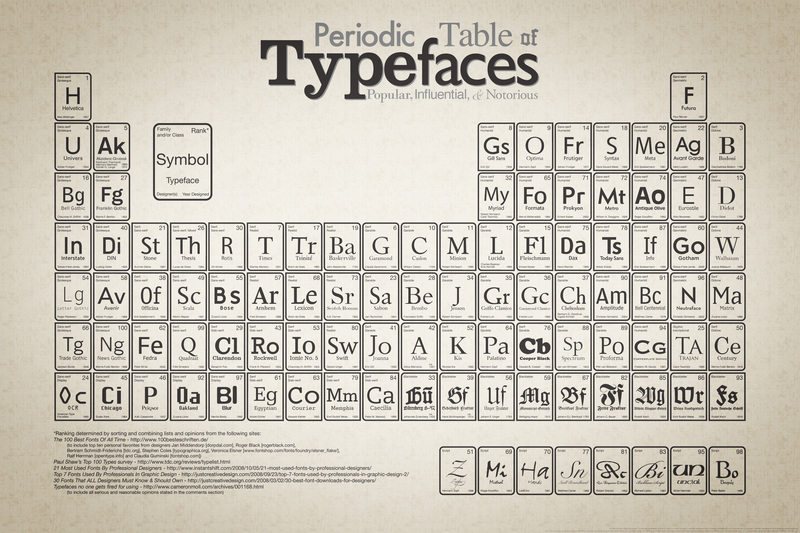 Of course, if they created a Periodic Table of typefaces properly, it wouldn’t look like the PT of elements, and so the visual analogy would be lost. The font table does at least group the fonts by family, and seems to be following the broad groupings found in Mendeleev’s table; the positioning of ‘Humanist’ looks to me to map onto non-metals, for example. But then, I don’t think the creator of the table is claiming to be revealing profound insights into how fonts relate to one another; I just included it as an amusing visual trinket. It’s like when people focus on the letters ACGT, or a schematic drawing of the double-helix, to mean ‘genetics’, as if genetics was *about* letters or molecules. Don’t even get me started on those who think it makes sense to embed or seek hidden messages in DNA using As, Cs, Gs and Ts.